Howlin' Wolf Records: SIX STRINGS: Thank You, Zack Snyder for BATMAN VS. SUPERMAN: DAWN OF JUSTICE!!! Thank You, Zack Snyder for BATMAN VS. SUPERMAN: DAWN OF JUSTICE!!! I want to use this post to write about my love for BATMAN VS. SUPERMAN: DAWN OF JUSTICE and use it as a 'Thank You' to Zack Snyder and everyone involved in making one of the greatest super hero films ever. The hate this movie has received is unwarranted and quite perplexing. I thought the theatrical cut was great but the restored true version was perfect and I mean that in all sincerity. The movie delivers a serious story that treats the audience with respect. It doesn't dumb down the plot by adding action beats every ten minutes or comedy at inappropriate times just to appeal to mainstream audiences who view the super hero genre as nothing more than "leave your brain at the door popcorn fare". 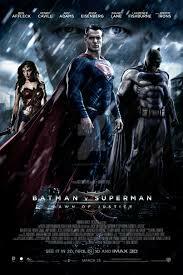 Thank you, Zack Snyder for this film. Like Superman doing great deeds and still being greeted with fear and hate, you too have given us a great film that has received the same. Everyone is entitled to their opinions but I find it so strange that this film and MAN OF STEEL have been held under a higher magnifying glass while other films with more problems are given a pass. See the CAPTAIN AMERICA: CIVIL WAR for example. CIVIL WAR is pretty much the same freaking movie yet receives high positive ratings! Don't get me wrong. I loved CIVIL WAR too but I think BVS was way better. By the way the Ultimate Edition of BVS is what I will be writing about. That is the true intended version of the film. As far as I am concerned the theatrical cut no longer exists. Essentially BVS is a Man vs. God story. Because of the abuse he had to endure as a child by his father, Lex Luthor (Jessie Eisenberg) has grown into a man who believes that there no such thing as a god who is good. To him people only pretend to be good but deep down inside they are selfish frightened creatures. Superman's existence contradicts Luthor's religion undermining his whole wold view by giving people hope of a better future. Lex sees no such future. CLICK HERE TO READ THE REST!!!! I completely agree! The director's cut fills in all the gaps and made for a great film. There's a conspiracy theory going around and I'm touching on it in my review of Suicide Squad on Monday which is also getting dissed by critics. I will be sure to check out your review!